Found in Bulgaria and Romania, L. jankae is reported to have the same rather pungent fragrance as L. pyrenaicum which we can best describe as a cross between an old, well worn tennis shoe and a rotting cabbage. L. jankae along withL. bosniacum and L. albanicumcum have at times been treated as varieties of L. carniolicum. The are closely related, but they do have distinguishing features by which they can be readily told apart. 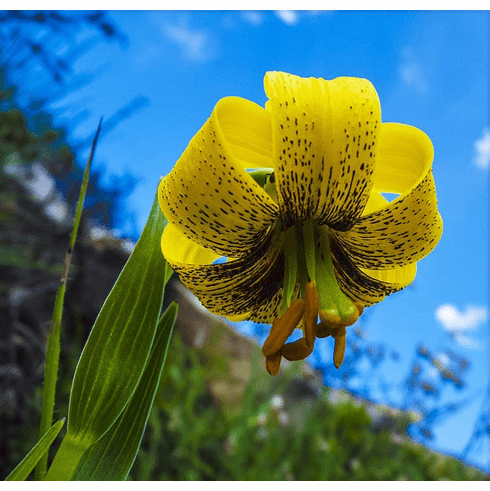 Pontus Wallsten reports in his book 'The lily species and their bulbs' that the main difference is the intensity of the purple black spotting in the centers. L. albanicum, a native of Albania is unspotted, L. jankae from Bulgaria, Serbia, and Romania is heavily spotted, while L. bosniacum is very heavily spotted and can appear with a deep purple center. Best grown in a well drained medium such as 'Sunshine Blend #4' and kept moist, never wet during inactive growth periods. Title photo was taken by and is copyrighted by Иван Коев . Taken in natural habitat, Bulgaria. Courtesy Wikimedia Commons. Original photo was cropped. This file is licensed under the�Creative Commons�Attribution-Share Alike 4.0 International�license. Inset photo #1 copyright Pontus Wallsten of Switzerland. Used with permission. Insert Photo #2 copyright Neva Micheva. Taken near Vitosha Mountain, Bulgaria. Courtesy WikiMedia Commons. This file is licensed under the Creative Commons Attribution-Share Alike 3.0 Unported license.